*ATAR605 God of creation gentle life-giver (Mitchell) Simple and lovely Trinitarian words to the tune BUNESSAN. I particularly like the phrase "stand with your people, whisper among us" when talking about Christ. New words to old tunes. *Online Resource God of creation Lord of all beauty (Schuman) A different set of words also set to BUNESSAN. I like this one too. Lyrics. New words to old tunes. *TiS 179 / NCH273 / VU312 / GA379 / StJ / URW073 Praise with Joy the World's Creator One of my favourite hymns - strongly Trinitarian lyrics and excellent imagery. I particularly love the “One God in community” phrase. Some versions change "Son" to "Christ" to make it more inclusive. Lyrics (scroll down). New words to old tunes. NCH278 / Cha062 / URW198 Creator God creating still (Parker Huber) Excellent hymn of hope for the future sung to a well known tune (ST ANNE). Lyrics and a critique. New words to old tunes. *NCH355 / UMH648 / VU514 / GtG303 / PH523 / W&R149 / Cha450 God the Spirit guide and guardian (Daw) Excellent, inclusive Trinitarian lyrics of God's guidance and blessing on leaders in the church community. Set to a variety of well known hymn tunes including HYFRYDOL (my favourite! ), JEFFERSON, BLAENWERN and BETHANY. Lyrics. New words to old tunes. *G(II)331 / GC472 / GC(II)488 / G(3)563 How Wonderful the Three-in-One (Wren) Stunning words sung to an old American Shape Note melody. New words to old tunes. Melody line, chords and lyrics. *NCH274 / CH118 / SFFS 2046 / GTG003 / CP390 / Cha014 Womb of Life and source of being (Duck / LADUE CHAPEL) Feminine trinitarian imagery. An easier tune, listed in some hymnals is IN BABILONE. New words to old tunes. Others have LADUE CHAPEL which is a little less intuitive. Lyrics. 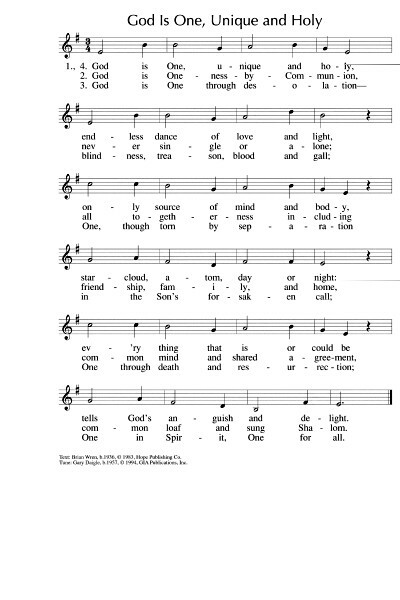 TiS 631 / AHB 510 / A&M630 / PH136 / CP(E) 418 Sovereign Lord of All Creation (Cross) I have listed this because if you have access to the Presbyterian Hymnal, this has a much better translation of this hymn "Father Lord of all creation" that can be sung to the same tune. Nice images. New words to old tunes. *ATW 459 I don't believe in a God up in the sky / God Version 1.0An excellent rock song about how we think about God, or not! Lyrics and mp3. Good for kids. *TiS 182 / AoV2-010 / NCH11 / CH134 / VU268 / GtG760 / SFFS 2047 / HPP13 / Cha010/ CP395 Bring many names beautiful and good (Wren) This is a beautiful song, but it's very long (especially if sung too slowly). Try singing one verse unison, then one women, one men, then all together again, to keep people interested in what they are singing. Lyrics. *URW126 Give thanks to the Source (Duck) Excellent words to a lovely lilting tune. PH135 / G(II)333 / GC476 / W&R139 God Is One Unique and Holy (Wren) Good words focussed on God's unity although many-faceted. Inclusive and great imagery. The tune is quite simple. Lyrics, sheet music sample and tune sample. 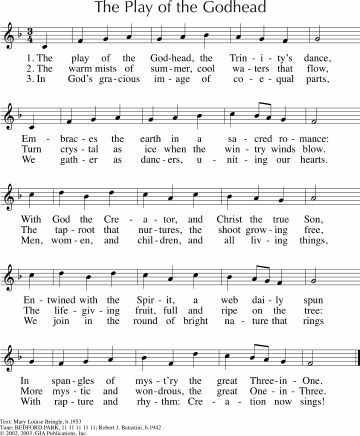 AoV2-084 Father and Mother Creator And Poet (Sears) Trinitarian song with a Creation focus. Sound sample and lyrics. *FFS47 Maker of mystery (Marnie Barrell/Gibson) Feminine trinitarian imagery. Tune is not hard, but can also be sung to the more familiar DOWN AMPNEY. New words to old tunes. *G(3)561 Holy and blessed Three (Melley) This is a pretty cool new setting to the old words by John Marriott. Sound sample. Lead sheet. *MV043 / GtG009 / GC(II)484 / G(3)564 The play of the godhead (Bringle / Batastini) Lovely words and a very simple, intuitive tune. "The play of the Godhead, the Trinity's dance, embraces the earth in a sacred romance". Lyrics, sheet music sample and fairly plain and slow tune sample. CP(E) 463 Holy Trinity of Love (Gaunt) Good solid words. Lyrics. MV056 / STB001 O Come let us praise / Lajahle htaora Hp'ya (Shwe) A good song from Burma. Quite beautiful - will need to be taught to Western ears. Sheet music. 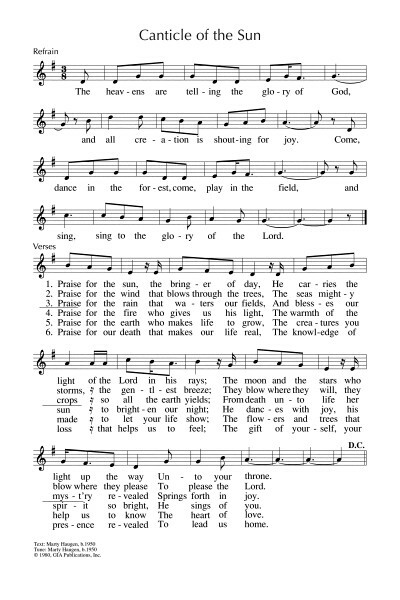 *MV 145 / CP418 / SP&P123 Draw the circle wide (Light) A great song about welcoming all people. Chorus is “Draw the circle wide, draw it wider still. Let this be our song, no-one stands alone, standing side by side, draw the circle wide”. *Online Resource How Great is your name! (Bruxvoort-Colligan) A fun Psalm refrain for kids with a cantor part. Good for kids. Sound sample and sheet music. *AoVK-50 / ATW 430 / NCYC'99 Come let us praise our God / A voice is heard (Trisha Watts) Excellent and energetic. Good for kids. PfAS008E O Lord Our Lord how majestic is your name (Fedak) Psalm response. TiS 90 / AHB 44 / UMH60 / VU867 / GtG806 / PH253 / A&M673 / CP346 / CP(E) 473 / W&R79 / Cha20 / PfAS146A / 82Hml-429 / StF079 / MP320 I'll praise my Maker while I've breath (Watts) A great classic hymn. Most sources are not inclusive; Voices United and Chalice hymnal are! Lyrics and sound sample. Oldy-but-a-goody. NCH Psalter008 How majestic is your name in all the earth (Dengler) A very simple refrain and chanted Psalm. Therefore being justified by faith we have peace with God through Christ who sent the Spirit. *BUC Song Project Spirit God You come (Loukes) A simple slow song, with lovely imagery of the Spirit coming, we can be confident about it. It would work nicely during a time of reflection. 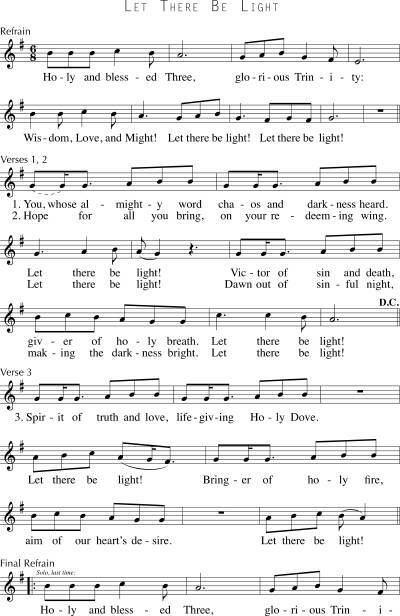 TiS 422 / CH594 / A&M242 / CP(E) 179 Come Holy Spirit come inflame our souls with love (Forster / DIADEMATA) Excellent words to a well known hymn tune. "Spirit of truth, arise; inspire the prophet’s voice" It is not fully inclusive. NCH63 / CH626 / UMH465 / VU368 / StS105 / LBW257 / ELW398 / HPP233 / CP(E) 184 / Cha241 Holy spirit truth divine (Longfellow) Good words seeking the presence of the Spirit in our lives. Hymn tune, very simple. *TiS 711 / ATOK 334 / Iona (M&G) / WoV681 / VU383 / SFFS 2124 / GtG283 / G(II)330 / StF038 Come O Holy Spirit / Wa Wa Wa Emimimo (Nigeria) This song is just fun. And very easy. Try to sing it in its original language (Yoruba), it sounds a bit inane in English and it’s not hard!! Encourage your congregation to dance a simple side-to-side step to this; they will enjoy it even more. If we can’t go a little crazy on Pentecost, what hope is there for us, really? A good song to help us remember that our faith is global, and to think of the church and all people in Africa. Sound sample (Thanks Thom!) Good for kids. Online Resource Spirit of Truth (Harding) A good and groovy song. Sound sample, PDF and purchasing options. CH613 / WoV687 / ELW401 / GtG287 Gracious Spirit hear our pleading (Niwagila) Good simple song about the Sprit. From Tanzania. Let me know what else you would sing... new resources? Something I've missed? I'd love to hear about it! Add a comment below. Where do I find New Words to Old Tunes? Sport for the confusion Pat - it's not a song book, it's jay a note to make it easier for people to find songs that use well known tunes - something that readers asked for in the survey last year. I am unable to find sheet music for Gord Johnson's Praise the Father. Do you have a source?